Woodmaster Precision Woodworks offers a wide variety of custom wood fabrication and millwork. Specializing in all types of cabinetry,furniture and doors. Every project we do is handmade by real craftsman in our shop with strict attention to every detail. 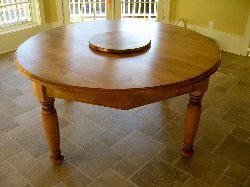 We use only the best quality materials and techniques and are dedicated to providing the absolute best quality workmanship available. We believe in complete customer satisfaction and strive to exceed your expectations. We use only solid wood and wood veneer plywood in all our cabinets no particle board or melamine products. Our cabinets come with quality hinges, ball-bearing hardware and laquer finishes. We build custom interior and exterior doors for replacement or prehung units. We use engineered lumber for all our doors to provide the most structurally stable product possible. We build a variety of handmade furniture from a common functional piece to a one of a kind family heirloom. Please have a look in the furniture section of the gallery for more.